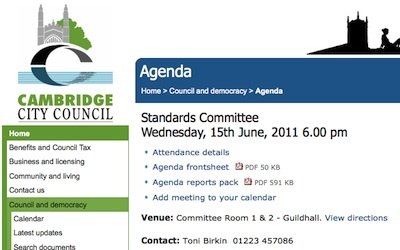 I observed a meeting of Cambridge City Council’s standards committee on the evening of Wednesday the 15th of June 2011. The committee is a mixture of appointed individuals and elected councillors. The first thing the committee did was elect a chair and vice chair. The chair had to be elected from the appointees. The committee elected Alan Clark as chair, unopposed, following a nomination from Cllr Taylor. Ashish Dasgupta, another appointee, was elected vice chair. The third appointee, Mike Williams, was absent, he had sent his apologies but no explanation for why he wasn’t present. No interests were declared. The meeting’s chair made a joke about this not meaning the matters to be discussed were uninteresting. I attended to use the public speaking slot to make some comments on the council’s annual complaints report. I have written about my contribution, and the debate on the complaints report, in a separate article. Much of the standards committee’s work gets done by sub committees. A subcommittee would for example consider a complaint against a councillor. The committee as a whole agreed how to split itself up into three subcommittees. The first substantive item was receiving and debating the council’s Annual Report on Prevention of Fraud and Corruption Policy. This focuses mainly on benefit fraud. Committee members noted that benefit fraud had become an issue higher up in the public interest at the moment. In 2010/11 the council’s fraud investigators recovered £109,101 from benefit cheats and ensured £103,805 extra council tax was collected from those falsely claiming single person discount. These sums were obtained following 932 investigations. One thing I found notable was that the council’s pursuance of innocent students through the courts because the council doesn’t follow the law on student exemptions isn’t dealt with by the fraud and corruption officers. This makes me wonder why not. I wonder if within the council there is an awareness that such students are, of course, innocent and I wonder just who in the council is pushing the policy of harassing students. (I have spoken to ex-council leader Ian Nimmo-Smith about this and he admits he knew those who he pursued through the courts when he was council leader were innocent). Why else would someone claiming a single person discount on council tax who the council thought wasn’t entitled to it get investigated by the fraud and corruption team, whereas students the council don’t think are eligible for a student exemption are not? The chair of the standards committee asked if the report should go to the full council. His argument was odd, he said all councillors should see it on the grounds: “It’s a creditable report”, it appeared he thought it was his role to push and promote good news. Officers explained it would be easy to send the report to all councillors, but that it wasn’t really necessary to debate it at the full council. Officers said that the overall governance report which goes to the civic affairs committee would contain a section on fraud and corruption. The Council will use an Independent Remuneration Panel to give advice on payments for Members and consider their advice when setting the Members’ Allowance Scheme. The Panel will operate in an open and transparent manner, making their agendas, reports and minutes available to the public. The council’s head of legal responded to say that either the policy or practice needed to change so the two were brought into line. The chair said he didn’t know when the next meeting of the full Standards Committee would be, and raised the possibility of there not being one at all if the Secretary of State abolishes standards committees. After the standards committee was closed another meeting then took place, also being chaired by Alan Clark, and attended by councillors including Cllr Taylor. I asked Cllr Taylor what this meeting was before she returned to the room, she said it was a Standards Committee (presumably a sub committee considering a complaint) but that she couldn’t tell me anything about it. I accept that these meetings may be discussing confidential matters; but the usual thing to do is to still list them on the council’s website, in fact it is my understanding of the law that this has to happen. Meetings of subcommittees of the Standards Committee have been listed previously on the council’s website. For an example see this Standards Sub Committee Agenda from 2009 which considered a complaint that Cambridge City Councillor Colin Rosenstiel had of brought his office into disrepute by obstructing an ambulance on Jesus Green. Council meetings cannot be held in secret, they may go into private session, but they can’t hold whole meetings in secret. The relevant law is Section 100B of the Local Government Act 1972 (a section added to the 1972 Act by the Local Government (Access to Information) Act 1985). I have made a Freedom of Information request to find out about the secret meeting. I have previously caught Cambridgeshire Police Authority holding secret meetings of the authority and got the authority’s chief executive to agree it shouldn’t hold secret meetings. This entry was tagged Openess on June 16, 2011 by Richard Taylor. The meeting was a consideration of a report by the Standards Committee. You could have attended but as you say, we were discussing confidential matters so we would have gone into private session almost immediately. The 2009 meeting was a Hearing, which has different rules. The fact the meeting was occurring should not have been secret. Usually when confidential matters are discussed by councillors the title of the report at least is made public. There should also have been a public speaking slot on the agenda and only when it came to the agenda item discussing the confidential item should the press and public have been thrown out. Once a confidential item has been debated, it is usual to invite the press and public back in and announce the decision made. I could not attend as I did not know about the meeting, it was not published on the council’s meeting calendar, or as far as I know elsewhere. When I could see the meeting was taking place, no one would clearly tell me what was happening. The chair just said something like “a few of us are staying here”.